If only New York was in some kind of realistic playoff contention. Not a good game at all five on five and Koskinen finally struggled, but sixteen goals in two games, nineteen in three, and three fantastic wins in four days, where they had to work very hard. They just beat a hot, rest team at home and a very good goaltender. This is not a league where even the best teams play many high scoring games. Michael Grabner has just been amazing and getting more confident in several area's of the ice, and obviously is making a run at Calder, player of week month, and whatever else is out there, and Okposo is just getting started even with Nielsen unable to finish at even strength. Comeau was not on the list of players practicing Saturday, apparently he was ready and had a nice backhand goal. Tavares another, Moulson looked hurt in second and that could linger. Wishart got his first, Jurcina a big pp goal? Remember those blog entries on defenders not scoring a while back or five goals on season. 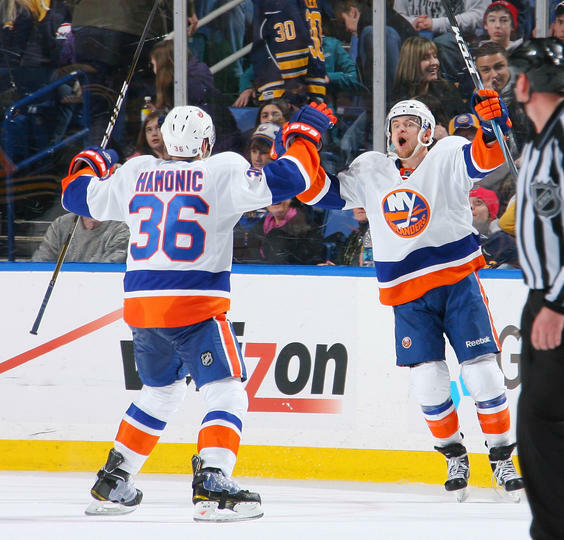 MacDonald and Hamonic keep rolling along and improving. Stick to Nielsen's face no call? MacDonald's play to stop breakaway down 4-2 was robbery. Al Montoya, far from perfect, but his first NHL win for New York, still cannot find a quote from him which is approaching Freddy Meyer like proportions going from NY-PHOENIX-back, with no interview. As for the media side show Mario Lemieux obviously has a selective memory and really did not need to go there and let the league handle the process. Not the first time he has done this when he does not get things his way, and his silence regarding his own players/coaches transgressions to control themselves speak volumes. Sure Lemieux should stick up for his team, but he wants to call out league, he should face consequences. Snow for his part stuck up for his team (Al Arbour/Denis Potvin were pleased and they know better than Lemieux) and Garth Snow sounded off like a professional executive, who asked the same questions this blog did, along with Howie Rose about the Pens not controlling their players. Sure he had a little creative tap-dancing spinning Gillies actions. Even Mario's former teammate, Rob Brown, had some criticism of Matt Cooke today out of Canadian media here. Snow should be proud of his players, and respectful of the process with his comments to the public. Charles Wang should not say a word. New York Hockey getting some media coverage, with friends like Newsday, we need no enemies. Larry Brooks must be very upset the Islanders are getting far more media play, than Cablevision's team to unleash his latest blind-unreasoning assault with no quotes from anyone to support his silly claims, but par for course from him. Not like Post is covering New York Islander hockey games. This even forced NY Times, Dave Caldwell, to even include score of Sunday's road win in another rare article. Islanders website already has post-game up with player comments. Of course the game now becomes who has the most friends/media of each side defend the other. Hopefully for the New York side, they are done. Oh well, on to Ottawa and perhaps a player of week for Grabner? He's heading toward the top ten in NHL scoring.